Badlapur is a revenge saga that features a bunch of talented actors – Varun Dhawan, Nawazuddin Siddiqui, Yami Gautam and Huma Qureshi have important roles to play. The film has been directed by Sriram Raghavan who has previously directed ‘Johnny Gaddaar’, ‘Ek Hasina Thi’ and ‘Agend Vinod’. 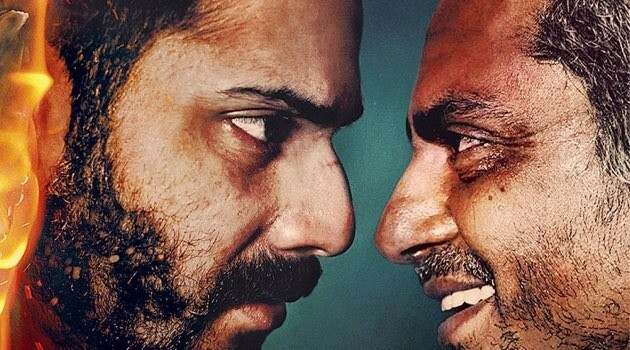 Badlapur is one of the most keenly awaited films because the promos always promised a hard-hitting dark revenge drama and showcased Varun in a completely new never-before-seen role. Story: Raghu’s (Varun Dhawan) life drastically changes when Laik (Nawazuddin Siddiqui) – a bank robber – kills Misha (Yaami Gautam) and her son Robin. The culprit Laik refuses to disclose the truth of his crime and details of his partner Harman (Vinay Pathak) who he blames is the man who fired the fatal shot. He is thus imprisoned for 20 years. Raghu awaits his revenge for 15 years to settle scores with Laik and his accomplice. The film is a transformational journey of Raghu from an optimistic outgoing person to a completely devastated lover. It’s a gripping unpredictable battle of wits and vengeance between Varun and Nawaz, one which might shock you several times during the film. Review: Badlapur starts off well. The first half is fast paced and gripping, the film loses pace immediately after Harman and his wife get murdered in the second half. The climax is unexpected and unpredictable, something that we don’t get in most hindi films. A few notable scenes include Raghu’s breakdown when he gets beaten by the truck drivers, Ashwini Keksekar’s entry sequence, Nawazuddin’s exit sequence from the jail. The problem with Badlapur is the slow-paced and sometimes boring second half, which lacks the necessary impact. Anil Mehta’s camerawork is brilliant and compliments the film well. Special mention to the music composed by Sachin-Jigar, all the three songs (Jee Karda, Jeena Jeena and Judaai) blend perfectly into the film. Performances: Varun Dhawan has come a long way as an actor and Badlapur will always be remembered as a film that showcases his versatility. His performance is subtle and controlled through the first half and completely erupts in the second. It’s a brave effort on his part to essay such a challenging role so early in his career. If Varun impresses, the man who stands out in Badlapur is Nawazuddin Siddique. He delivers the performance of a lifetime, as if he were born to play Laik. From his appearance, to his accent to his mannerisms, he entertains you in every frame. It’s the battle between Varun and Nawaz that makes up for the slow pacing of the film. Badlapur works more for its performances than its unparalleled story. Yami Gautam and Huma Qureshi don’t get enough screen-time to showcase their talent, but they do well. Radhika Apte is impressive and Vinay Pathak is good too. Overall, Badlapur is not as gripping as Sriram Raghavan’s ‘Johnny Gaddaar’ nor does the climax shock you like ‘Ek Hasina Thi’, however, the film does manage to keep you involved because of the powerful performances by the lead actors. Performances are top notch. Nawazuddin is terrific, Varun does well too. Rating: 3 stars + half a star extra for performances! I cant wait to see this movie ..its one of my most anticipated movie for the year. Also nawaz sidiqi has overshadowed varun dhawan …….! Nawaz sidiqi is the hero….! I am pretty excited. I love dark films . I will watch on monday or tuesday. We emraan fans are used to watching dark films. All the best . Reviews look decent. Might be drawbacks and flaws in second half due to slowness. Overall , will watch! Varun ‘s dialog delivery is poor n awful ……..!! …. That is evident from promos …….! …. That is also main drawback …..! His voice is childish ……!! … This might add to bad WOM along with Poor n dragging 2nd half …….!! Varun is better than among newcomers.Sid & Arjun r miles behind frm him. The film have got rave reviews so far from the critics.It will surely translate into good collections. and I forgot about pk which u had also given 3.5.
wow just going to watch nawaz bhai. Want to see the movie! [email protected]: there is no mentions about the performances by Yami,Huma and Divya Dutta and the roles of the latter twos! Going to watch this surely unlike films like Shamitabh and ROY which I skipped though still wanted to! Going by review, both movie and 2015 deserve a blockbuster!!! After long time, a movie got good review(last movie was Baby!!! Just seen Star Stop on B4U n both guys are so down to earth n genuinely humble- Nawaz is a great actor n Varun is the next big thing in Bollywood imo…! Didnt like the review- dont know how you can say a film is abit boring yet the performances of the actors keep you intrigued- I mean all movies run on their starcasts performances n if the performances keep you captivated then where does boredom come from…? Obviously you have seen the film so there may have been scenes that could have been cut out but I dont think that merits you labelling the film boring. Story cant stray so with a limited scope as to where storyline can go I feel they have done the best with what they had. Will see tomorrow whats what but Im super excited about watching Badlapur and Im sure it wint be as boring as you claim. PS two other reviews have raved about Nawaz’s performance n I cant wait to see Varun after HSKD… Go Varun Go n first hit of 2015 is round the corner. 3.5 rated films r overrated mostly…..!! ..
Badalpur…. Yeah looks and sounds solid…. Well quite optimistic Varun will get his 4th clean hit! And how can one 4get to mention siddique nawaz…he definatly adds those suspense chilly trills in all his movies with an almost accurate display! !